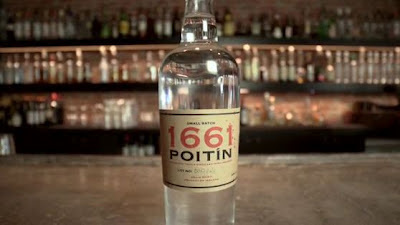 Let's cut to the chase, because time is short: if you want to help resurrect the traditional Irish spirit known as poitín, you can kick a few bucks into the 1661 Poitín venture on Kickstarter. Only five days remain for this project to meet its funding requirement, so don't tarry! Poitín (or poteen) is the other great Irish spirit, a sort of a democratic version of whiskey. It is made in much the same way but typically at a much smaller scale and with, let's say, less of the fuss of taxes and regulations. It was outlawed in Ireland in 1661 (hence the name of the new drink), its good name only fully restored in 1997. Fortunately there were plenty of, ah, hobbyist craftspeople who kept the knowledge of making this artisan product alive in the wilder parts of the country. We haven't seen much poitín on the shop shelves yet though. There are a couple of brands but we don't really know what's in them and I don't know who drinks them. Cooley made a much bigger splash recently with a single pot still version. While the illicit sort of poitín might include potatoes and sugar in its recipe, I imagine future commercial bottlings will stick to grain spirit, ie unmatured whiskey. There is no legal definition that I know of but "Irish poitín" is a protected EU geographical indication (it's listed under "other spirits"). This 1661 Poitín is made entirely from malted barley. Although it's not in production, test batches have been made, tasted and refined until it's as good as it can be. I've never come across any moonshine in Ireland (we are very law-abiding in Dublin!) but I've sampled new spirit from various distilleries, as well as the existing commercial poitíns. The aroma can be quite spectacular and entirely unlike whiskey. It could be bananas and pears or something more floral. The taste is a bit less familiar but can be herbal or porridgey. There is plenty of variation possible depending on the still and the grain mash so I believe a carefully tuned recipe could be delicious. The particular distiller involved is a secret. Although there are photos of Kilbeggan distillery on the Kickstarter page, these are for illustration only; it is not being made there. I'm guessing it's not being produced by Cooley at all, and the other two whiskey distillers don't do projects like this. So is it one of the brewers said to be setting up distilling capacity in Kerry? It would make a lot of sense for a new whiskey distillery to sell some of its spirit straight away rather than wait five years or more for some decent whiskey to mature. Ashlee Casserly, the prime mover behind this venture, has framed the project as bringing poitín to the United States. It's more than that though. The category needs to be revived in Ireland too. It's hard enough to get Irish people to try whiskey, let alone something which has the reputation of causing blindness and death (due to low quality backyard distillation). There is no reason poitín can't be a successful drink - neat, mixed or in a cocktail. It's no worse than vodka or the Chinese bai jiu (unmatured rice spirit) that the drinks majors are so excited by these days. Plenty of nations have developed a taste for unaged, strongly-flavoured spirit. I would love to see 1661 Poitín come to life. Ashlee Casserly seems to have got everything in place to make that happen, bar the initial funding. I've seen other Kickstarter projects that pre-sell a product but I suspect that can't happen in this case because of strict rules regarding the flogging alcohol. There are lots of other perks for becoming a project supporter, however, so check it out and perhaps help to reintroduce the Irish and the world to a great traditional taste of Ireland.